The issue of climate changes impact on the biology and ecology of bears interested Polish information TV programme, "Teleekspress". TV editor Michael Hajdenrajch prepared material in which Dr. Agnieszka Sergiel and Prof. Nuria Selva explained how climate changes influence the behavior, physiology and diet of polar and brown bears. We recommend this short but very interesting material http://teleexpress.tvp.pl/27324629/zmiany-klimatu-spedzaja-niedzwiedziom-sen-z-powiek . (unfortunately only in Polish). An interesting interview with Nuria Selva, leader of the GLOBE project, was published in one of the most influential Polish weeklies, “Tygodnik Powszechny”. Nuria talks about her research, about Puszcza Białowieska, about bears and about her perception of life. Truly interesting read (unfortunately only in Polish)! Virginia Morell from ScienceMag.org wrote a note on a study on the behavior of mother brown bears in Scandinavia. Adult male bears are known to kill cubs that are not theirs—and sometimes the mother that defends them. A new study by the Scandinavian Brown Bear Research Project team, authored by Steyaert et al. suggest that brown bear females use humans as protective associates to shield her cubs from male attacks. Read that interesting story at http://www.sciencemag.org/news/2016/06/mother-brown-bears-protect-cubs-human-shields. We recommend to all interested in the research on the brown bears a movie from the series "Dancing with Nature" realised by the TVP http://www.tanczacyznatura.tvp.pl/21488540/odcinek-5-wsluchani-w-niedzwiedzia. Nuria Selva, Tomasz Zwijacz-Kozica and Filip Zieba talk about what and how we study in, among others, the GLOBE project. Telemetry requires capturing and immobilizing bears so they can be equipped with a collar which allows to take bear’s position. Captures are done from helicopter and using box and Aldrich traps with an alarm system. During immobilization we take measures and samples according to established protocols to assess the bear’s condition. We use GPS-GSM-VHF collars with a drop-off system. This means that the belt of the collar opens and drops after a scheduled period of time. Additionally, the collar drop-off can be activated through a radio-remote control. 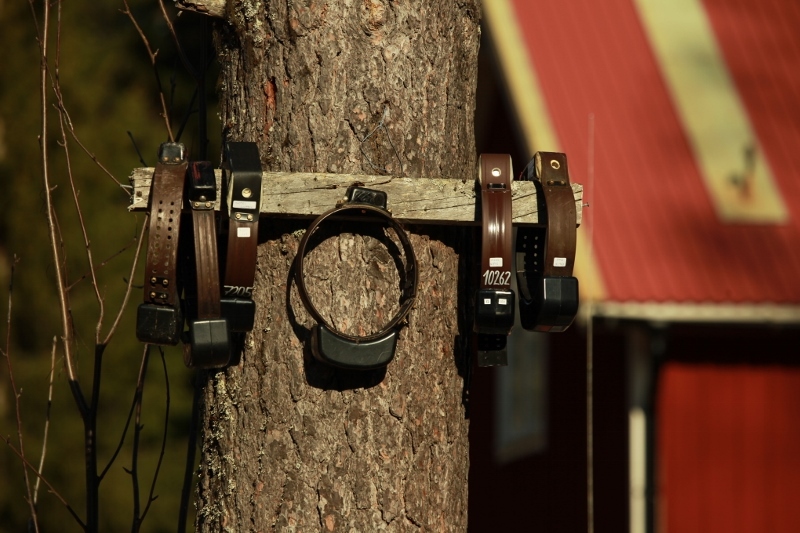 These collars havea GPS receiver, a GSM-module and a radio transmitter (VHF). Once fitted to a bear, the GPS-GSM module is located on the top of the collar, and the battery down to counteract the weight. GPS-GSM collars allow to collect a large amount of high-quality data, given that bears’ positions are taken very accurately. GPS is a satellite navigation system. By receiving signals from satellites, the GPS (Global Positioning System) receiver in the collar calculates its position in longitude, latitude and elevation. Hence one will get a very precise picture of the animal’s movements independently of time of day and area. However, each positioning requires battery power, making the positioning frequency a trade-off between how often one needs positions for the study and how long one needs to collect data from that bear. The disadvantage of GPS-collars is that they are technically complicated and not as robust as the radio-collars, and they are very expensive. The radio transmitter (VHF) in the collars allows to manually localize (radio-track) bears with a receiver that picks up VHF radio signals from the collar at certain distance. By triangulating directions of the signal, we can estimate the position of the animal (generally within a few hundred meters accuracy). To receive the transmitter signal from ground, we must be within a few kilometers, or sometimes a few hundred meters, from the bear, depending on terrain. Radio-tracking in mountainous areas is more complicated. We radio-track from cars, by foot and sometimes also by helicopter. Additionally, the collars have a temperature and activity sensor. In our study we programmed the receivers to take a position at different time intervals (every 30 min, 1, 2, 3 or 4 hours) during spring, summer and fall, and less frequently during winter, while the bears are denning. All bears’ positions and activity data are saved in the GPS, and additionally the GSM module sends the latest positions as an SMS to a receiving station connected to a computer. The GPS-positioning schedule can be reprogrammed according to the needs. Very frequent positioning enables us to study more precisely aspects of bears’ biology at smaller scales, such as their movements through the landscape, predation and individual behavior. By having few bears equipped with GPS-collars simultaneously in the same area, we can investigate interactions among bears.